Leeds City Council has teamed up with Leeds Building Society to help more first-time buyers in the city onto the housing ladder. They have this week jointly launched the “A helping hand” initiative which will make even more much needed 95% mortgages available to residents within the Leeds area who can afford the mortgage repayments but are currently unable to provide a large deposit. This is possible through a combination of the local authority placing funds with the UK’s 5th largest building society as security and Leeds Building Society providing a very competitive mortgage that requires only a 5% deposit. “We have operated in the city since 1875 and are a major employer in the region. Therefore, Leeds and its residents are very important to the Society and I am delighted that we are working in partnership with the city council for the benefit of people in Leeds. As well as the obvious synergies, we also share the same ambition. We aim to be Britain’s most successful building society and the council’s ambition is to make Leeds the best city in the UK. “We have offered mortgages throughout the economic downturn and continue to increase lending, particularly to first-time buyers, through our shared ownership, shared equity and guarantor mortgages. In the first half of this year, new loans rose to £769m, which represents double our market share. Over a quarter of these mortgages have helped almost 2,500 first-time buyers purchase their first home. The new 95% mortgage is a 5-Year Fixed Rate at only 5.49%, with discounted fees and a free valuation, providing security at an affordable rate. Normal lending criteria will apply, so only those first-time-buyers who can comfortably afford to make repayments will benefit. The city made a deposit into a ring-fenced, interest bearing account with the Society and will only incur any costs if the mortgage lender suffers any loss. “We are delighted to be announcing this exciting and innovative new partnership with the Leeds Building Society to help local first-time buyers secure their first homes. For more information, customers can call into their local branch or call the Society’s mortgage hotline, on 08450 540 994, where qualified mortgage advisors are available seven days a week from 8am to 8pm. · Tapered early repayment charges of 5% of the amount redeemed in years 1 and 2, 4% in year 3, 3% in year 4 and 2% in year 5. The helping hand 95% mortgage is available to first-time buyers only in the Metropolitan boundary of Leeds and includes some areas with a Bradford and Wakefield postcode. 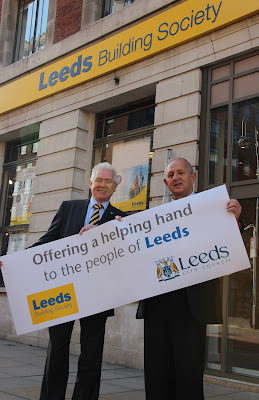 Leeds Building Society has assets of £10bn (as at 30 June 2012) and 67 branches throughout the UK, Gibraltar and Ireland. The Society has operated from the centre of Leeds since 1886.